Zack Hyman had points on both the Leafs’ first and last goals, which were scored on two-on-ones. In the first period, Mitch Marner converted a pass from Zach Hyman to open the scoring. On the game-winner, it was Hyman setting up Rielly. Rielly’s goal was his 53rd point of the season, matching a career high. Auston Matthews registered his fourth goal in his last five games and 24th on the year, dangling the puck around no fewer than three defenders for a highlight-reel marker. With the Leafs trailing 2-1 in the second period, Frederik Andersen stacked his pads to make a momentum-turning save, contorting his body a la Dominik Hasek. Andreas Johnsson scored on a backhander for his 13th tally of the year. John Tavares registered his 32nd goal of the season on an odd man rush after the Leafs’ counter attack was sparked by Matt Duchene whiffing on a scoring attempt, on a Senators’ 3-on-1. Hall of Fame broadcaster Bob Cole called his last regular season game in Toronto. Cole, known among other things for his signature call “Oh Baby!”, will also be behind the microphone for the Leafs’ last game of the year in Montreal. For all the entertainment of the Leafs’ offence, the team was very lackadaisical in its own end for extended stretches of the game, blowing a pair of leads. The sloppiness was evident in the third period as Toronto allowed Ottawa to score twice in the first four minutes to even the score. In particular, Rielly was caught puck-watching on the tying marker by Magnus Paajarvi who had a wide open net for a tap-in. The Gardiner-Zaitsev pair struggled mightily. On Ottawa’s first goal Paajarvi sped past Gardiner and got a step on Zaitsev. The play unfolded as a result of a terrible Leafs’ line change. Jake Muzzin played in his 500th career NHL game, although his time on ice in the first period was shortened after he left the bench as a result of a hard hit he sustained from Ottawa defenceman Thomas Chabot. 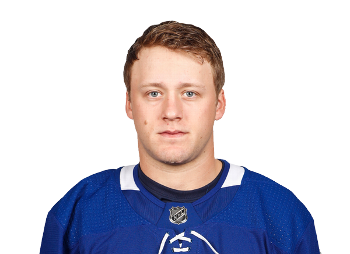 Zaitsev’s frustrations were epitomized on the Sens’ second goal, by Matt Duchene. Bobby Ryan’s shot attempt deflected off Fredrik Andersen, then off Zaitsev’s face, before the puck was retrieved by Ryan Dzingel who fed Duchene for the goal.